Funny how things go. A few weeks ago I got a nice email from the Kalahari Pepper Company, wanting to know if I'd be interested in trying their Peri-Peri sauce in some of the African cooking I was doing. Never one to turn down free food of any kind (even if I don't know exactly what it is), I gratefully accepted. A week later, a package of mild, hot and extra hot Rhino Peri-Peri sauce showed up at my door. We immediately opened a bottle and tested it out. It was fragrant, spicy and a lovely orange color - perfect for dipping, adding to soups and stews and...marinating. By complete coincidence, while searching for a recipe for tonight's Portuguese meal, the first one I landed on was for barbecued chicken, marinated in Peri-Peri sauce. Turns out, Peri-Peri sauce is a regular staple used in both African and Portuguese cooking. I do believe the saucy Foodie Goddess was hovering over me today. 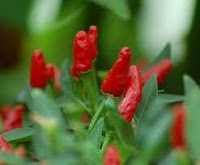 Known as Africa's hottest chili pepper, the Peri-Peri is grown in and exported from Botswana and Mozambique for the Kalahari Pepper Company. Not only that, but a portion of the profits from the sale of Rhino Peri-Peri, goes to Save the Rhino International. Any time I come across companies that put out a great product and give back to the community or a cause, I'm thrilled to do business with them. Thank you Kalahari Pepper Company! 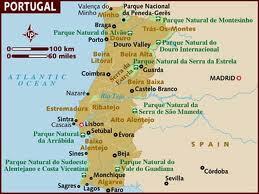 Settled since pre-historic times, Portugal is a southwestern country on the Iberian Peninsula. The country is bordered by the Atlantic Ocean and Spain. The Atlantic archipelagos of the Azores and Madeira are part of Portugal as well. In 29 BC, Rome integrated Portugal into it's empire as the provinces of Lusitania and part of Gallaecia. As a result, Portuguese culture and the language were strongly influenced by Roman settlers. Portugal claims to be the oldest nation state, and established itself as a global empire thanks to numerous maritime explorers who amassed territories in Africa, Asia, Oceania and South America (all of which are now independent countries). Portuguese cuisine is somewhat similar to Mediterranean cooking, and tends to be rich, spicy and filling. Once Portugal's colonial possession, African culinary traditions, particularly spices such as Peri-Peri, black pepper, cinnamon, vanilla and saffron are evident. Olive oil, garlic, coriander and parsley are all frequently used as well. The Portuguese people consume the highest amount of seafood in the world, and the country is known for its culture of fishing. Chicken, linguica and pork also provide sources of protein. Tomatoes, onions, beans, cabbage, potatoes and kale are commonly eaten vegetables. Cheese, pastry, egg-based custards and wine also dominate Portuguese cuisine. Clean the chickens (removing any excess fat or giblets inside the cavity and thoroughly rinse, then drain and pat dry. Place the bird, breast side down, on a cutting board and with a large, sharp knife, cut it through the center, but don't slice it in half. Spread the bird out, then with a mallet, BEAT IT UP!! A few good smashes should do it! You want to be able to open the whole chicken flat on the grill. Combine the remaining ingredients in a blender and pour half the sauce over the chickens in a large non-reactive pan or bowl. Cover and let marinate in the fridge for 4 hours (20 hours max if you want a spicier version). Refrigerate remaining sauce. Place chickens, skin side up, on the grill of a gas or charcoal fire. Brush the chickens with some of the remaining marinade and cook until ready, continually basting the chickens, being careful not to have the flame so high that the skin burns before the inside is cooked. Give the chicken at least 15 minutes per side on a medium-low flame, turning often - you may need more time if the chickens are large. Poke a fork in the thickest part of the meat - when the juice runs clear - they're done. And don't worry, you can toss them back on the grill if need be! Final Assessment: Oh yeah! Spicy, sweet, smoky, rich and tasty! I actually put them back on the grill after to cook another 10 minutes as the meat was just a little too pink for my liking. As long as you keep the flame or charcoal to a medium temp, you won't burn the meat. I only marinated this batch for 4 hours, but I may try over night next time. Awesomesauce! wow !! Simply superb !! They way you take pics ,the way its cooked and the final dressing everything makes me hungry !! Great post loved it !! Especially the butter pic i loved it !! Thanks, Sheril! I'll send you the butter pic. I'll bet you'll be the only person in the world with a butter screen saver :) Best Regards, Always! Ah Ah ..its nice to meet you after a long time .. k how was the taste of this dish ???? I m gonna explore your site so that i can take some great pics !! hehehe . Next time pls do take a lot of pics on that butter cubes especially some macro shot ..its awesome ! !